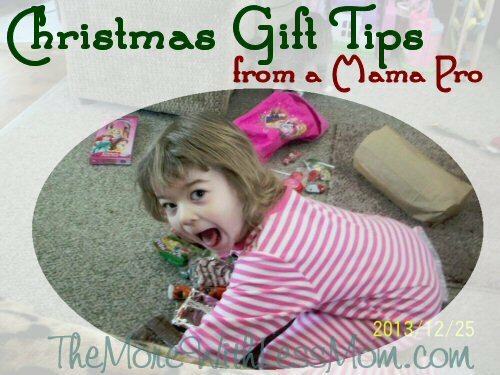 Here are some tips for Christmas and gift giving. With four kids you have to be organized. Over the years I have developed some methods for making things easier, keeping track of everything, and not spending too much. 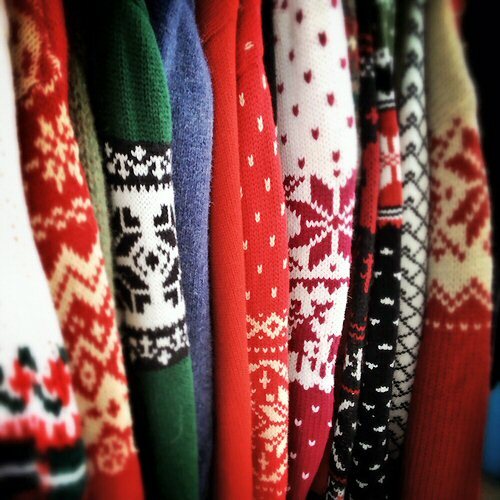 Have a place for gifts, like a hall closet or the attic. You should have somewhere for random birthday and hostess gifts (gift closet? ), and a place for Christmas gifts. This can be the same place, but there should be an official place. This should be accessible year-round so if you get something from a yard sale or clearance you can stash it. 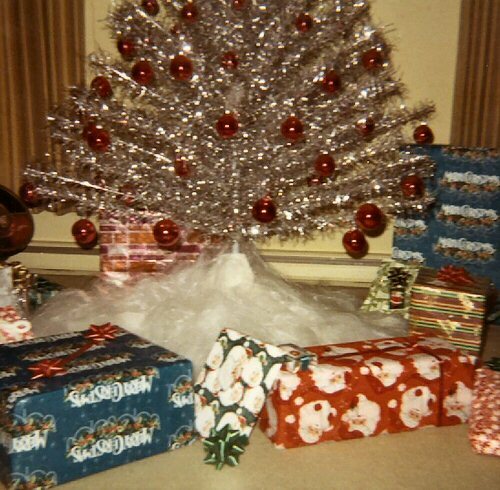 We are very clear from a young age, the rule is if you see a present, wrapped or not, you don’t get it. My kids know I will follow through, and I keep their gifts hidden where they won’t see them casually. I don’t want little ones climbing around trying to kill themselves in my closet sneaking a peek. Keep track of your gifts. You can keep track in a notebook, a household binder, a Word doc, a note on your phone… How you organize this will be whatever works best for you. 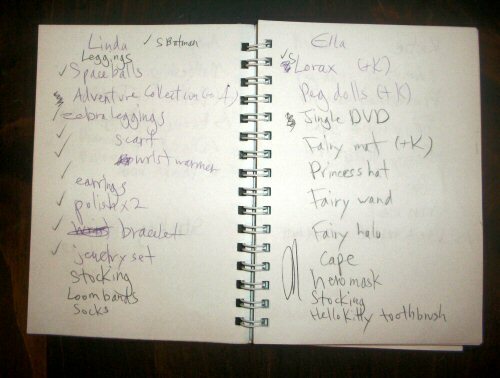 I used to have a gift notebook and kept sections for people, ideas for gifts to make, etc. Now I keep my information on the computer. When you get your purchase home, or even right when you buy it, make a record of it. If a gift is something that will have a lot of influence, like you bought curtains you need to match things to, I take a photo so I can see what I have without digging it out. I use this list to keep track of what I have purchased, what I have received (what has been shipped and arrived), what I have to make, what I have made, and what I have wrapped. When something is wrapped I put a check next to it. This photo is my working list for a weekend crafting/wrapping marathon. You can see that wrapped items have a check. Later this will all be entered into the master list. Be prepared to shop. Have a list with you (including in late December when you hit the Xmas clearance sales) of sizes and colors people like. On my phone I have a note with clothes and shoe sizes. I have a pic of the curtains we are basing my daughter’s room around. This way I have this info with me wherever I go. I also keep a note on Facebook that is visible only to me just in case. I update these lists often as little ones grow. You should always be shopping for gifts. This means you should always have money in your budget for gifts, even if it’s a little bit every month. One year I got a snowboard and boots at a yard sale in the summer. It was a great deal, but it was enough money that if I had not had the money set aside my daughter would not have gotten a snowboard that year. 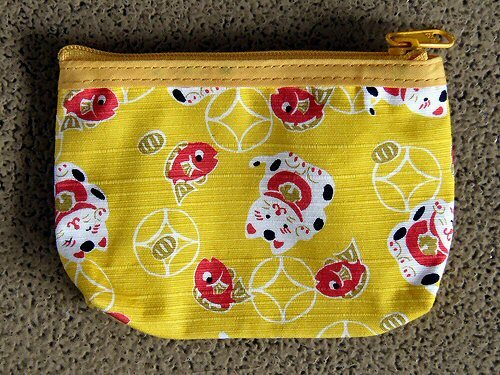 I have a little change purse that is specifically for this money, it lives in my purse so I have the cash if I need it. Otherwise it is not touched. If you have something specific in mind you can check Craigslist or eBay periodically. You could get a friend a 50s hutch that will go perfectly in their retro dining room, for cheap if you hunt. You can get your niece a used iPad without worrying about eBay weirdness, from Craigslist. Look around for something before you run to the store. You could find a nicer item that is just older. If Black Friday is not your thing don’t forget that many online retailers offer free shipping, if not great deals, between Thanksgiving and Christmas. If you know you want to buy something online you can wait until this period and use their free shipping and often a discount code to get the same item. This past season I got some good presents from the Claire’s online clearance with free shipping and a discount code that still came off of clearance items, and I went through eBates. In our family we don’t give a lot of gifts, so you have to put some thought into the gift you do give. You should always pay attention to your loved ones so when a new interest pops up you can use that idea when shopping. And it never hurts to pay more attention to your loved ones. Consider your purchases, make them more deliberate. Once you spend those dollars they aren’t coming back. 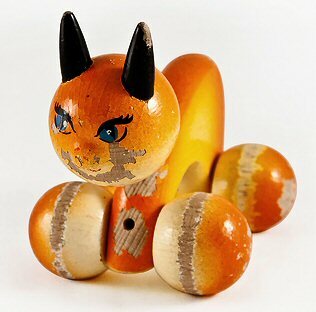 Are you wasting money on junk that will break the first day, or something your recipient won’t really like? You should always be looking for crafts to make. Before the days of Pinterest, you had to go to the library and check out a bunch of books and pour over hundreds of ideas. Now you go on Pinterest and can get completely overwhelmed and not dig yourself out for a week. There are some good boards to give you ideas specific for your recipient, like Gifts for Geeks DIY. Or you can make general things like hot cocoa in a mason jar that can be a hostess gift or a mailman gift. This means that you should also always be on the look-out for supplies for your crafts and wrapping. You can’t beat yard sale prices for mason jars. If you have some ideas in the spring for what you want to do next Christmas, you can look at yard and rummage sales for supplies. If you hit the right lady you can get tons of yarn for practically free. Keep an eye out for ribbons and embellishments for your gifts, too. Also you can start way early in the year and not feel so pressured during the holiday season. One of the most popular gifts I have made was a rose oatmeal scrubbie. 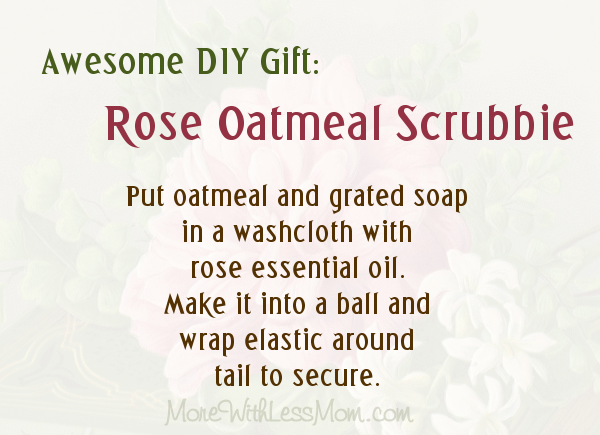 You put oatmeal and grated soap in a washcloth with rose essential oil. Make it into a ball and wrap elastic around it to secure. This was nearly free for me to make, but it smelled so good people just raved about it. 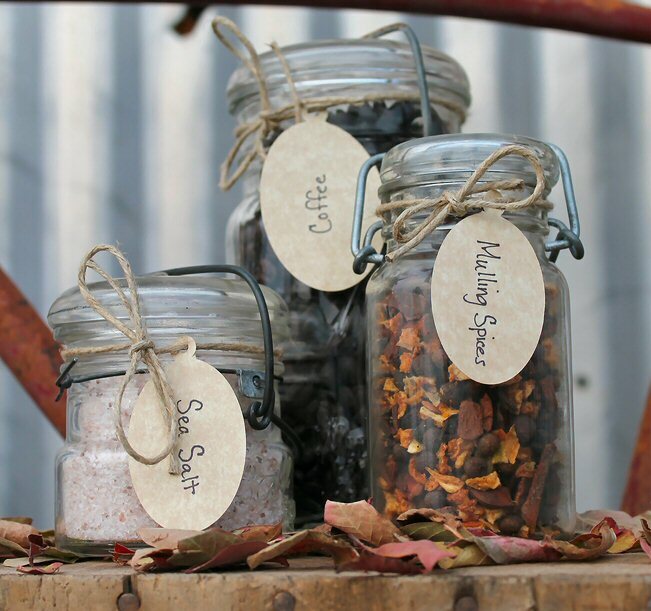 Don’t think that because you made it it will seem cheap, this gift made the recipient feel like they got a spa treatment. Homemade vanilla is a great gift, but it has to sit for 6 months. Plan ahead and you can get ahead. If you have all of your crafting gifts done in September you will have that much more time to enjoy the holidays. Cut open a toilet paper or paper towel roll and use that to hold a roll of wrapping paper closed. I find that sometimes the toilet paper rolls just give out and don’t hold, but the paper towel rolls last longer. I used to use elastic bands but I found these were getting caught and tearing my paper. Shop for next year’s wrapping paper in this year’s clearance sales. 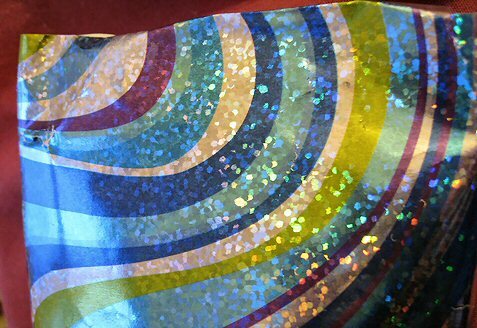 I only buy holographic/super sparkly paper new, since I am raccoon-like in my love for shiny things. Also grab some clearance gift bags you can use for gifts year-round, like that surprise birthday party. Don’t be afraid to use unconventional materials to wrap. Stick a bottle of wine in a sock and wrap that other sock around the neck like a bow. Get a pretty pillowcase from the thrift store to wrap with and the recipient can use it to wash their delicates in the washer. Save paper from gifts you receive, just like grandma did. If you use saved paper underneath your tree will be a beautiful patchwork of different papers. My sister thinks paper is wasteful, so she only uses gift bags, which you can use over and over. Roll out brown kraft paper on the floor and let the kids go to town with markers, stickers, or paint and their hands and feet. Or make a star stamp with a potato, stick it in glue, and sprinkle glitter on your stars. I don’t waste money on tags anymore. I use a sharpie to write the recipient right on the gift. If I want a tag I will fold over a scrap of wrapping paper to make a tag, or print something really pretty I find on Pinterest. I have had gifts lose their tags so I always write the recipient on a piece of tape on the bottom. This way if the gift gets wet, the tag gets lost, the paper gets torn, or the dog eats it I might still be able to figure out who it is for. Wrap early, especially if you have small children in the house. I pretty much have to wrap when the wee ones are asleep. I know some people leave it until Christmas Eve and wrap it all at once. And stay up way too late. I try not to torture myself any more than necessary, I pull the wrapping paper storage containers (clearance from Brylane Home) out with the Halloween decorations and start wrapping then. Shared with Busy Monday, Frugal Family Linky, Natural Family Friday, and Treasure Box Tuesday. I really like making gifts, but of course you have to plan ahead. 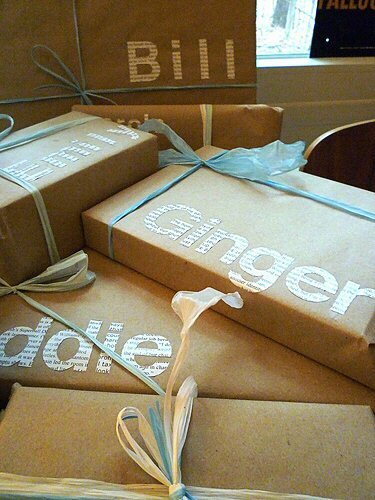 Great ideas for storing wrapping paper. I love the alternative wrapping suggestions too. Why thank you. It seems like these things multiply when your back is turned and it’s a constant struggle to manage.